1. A chronic pain client reports to you, the charge nurse, that the nurse have not been responding to requests for pain medication. What is your initial action? a.Check the MARs and nurses’ notes for the past several days. b.Ask the nurse educator to give an in-service about pain management. c.Perform a complete pain assessment and history on the client. 2. Family members are encouraging your client to “tough it out” rather than run the risk of becoming addicted to narcotics. The client is stoically abiding by the family’s wishes. Priority nursing interventions for this client should target which dimension of pain? 3. A client with diabetic neuropathy reports a burning, electrical-type in the lower extremities that is not responding to NSAIDs. You anticipate that the physician will order which adjuvant medication for this type of pain? 4. Which client is most likely to receive opioids for extended periods of time? 5. As the charge nurse, you are reviewing the charts of clients who were assigned to a newly graduated RN. The RN has correctly charted doseand time of medication, but there is no documentation regarding non-pharmaceutical measures. What action should you take first? b.Refer the new nurse to the in-service education department. d.Give praise for the correct dose and time and discuss the deficits in charting. 6.In caring for a young child with pain, which assessment tool is the most useful? 7.In applying the principles of pain treatment, what is the first consideration? a.Treatment is based on client goals. b.A multidisciplinary approach is needed. c.The client must be believed about perceptions of own pain. d.Drug side effects must beprevented and managed. 8.Which route of administration is preferred if immediate analgesia and rapid titration are necessary? 9.When titrating an analgesic to manage pain, what is the priority goal? a.Administer smallest dose that provides relief with the fewest side effects. b.Titrate upward until the client is pain free. c.Titrate downwards to prevent toxicity. d.Ensure that the drug is adequate to meet the client’s subjective needs. 10.In educating clients about non-pharmaceutical alternatives, which topic could you delegate to an experienced LPN/LVN, who will function under your continued support and supervision? 11.Place the examples of drugs in the order of usage according to theWorld Health Organization (WHO) analgesic ladder. 12.Which client is at greater risk for respiratory depression while receiving opioids for analgesia? 13.A client appears upset and tearful, but denies pain and refuses pain medication, because “my sibling is a drug addict and has ruined out lives.” What is the priority intervention for this client? c.Explain that addiction is unlikely among acute care clients. d.Seek family assistance in resolving this problem. 14.A client is being tapered off opioids and the nurse is watchful for signs of withdrawal. What is one of the first signs of withdrawal? 15.In caring for clients with pain and discomfort, which task is most appropriate to delegate to the nursing assistant? a.Assist the client with preparation of a sitz bath. d.Evaluate relief after applying a cold application. 16.The physician has ordered a placebo for a chronic pain client. You arenewly hired nurse and you feel very uncomfortable administering the medication. What is the first action that you should take? b.Check the hospital policy regarding use of the placebo. c.Follow a personal code of ethics and refuse to give it. d.Contact the charge nurse for advice. 17.For a cognitively impaired client who cannot accurately report pain, what is the first action that you should take? a.Closely assess for nonverbal signs such as grimacing or rocking. b.Obtain baseline behavioral indicators from family members. c.Look at the MAR and chart, to note the time of the last dose and response. d.Give the maximum PRS dose within the minimum time frame for relief. 18.Which route of administration is preferable for administration of daily analgesics (if all body systems are functional)? 19.A first day post-operative client on a PCA pump reports that the paincontrol is inadequate. What is the first action you should take? a.Deliver the bolus dose per standing order. b.Contact the physician to increase the dose. d.Assess the pain for location, quality, and intensity. 20.Which non-pharmacological measure is particularly useful for a client with acute pancreatitis? 21.What is the best way to schedule medication for a client with constant pain? 23.For a client who is taking aspirin, which laboratory value should be reported to the physician? 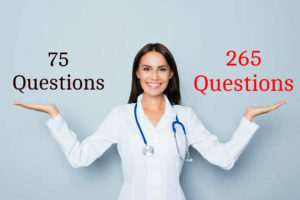 25.A family member asks you, “Why can’t you give more medicine? He is still having a lot of pain.” What is your best response?